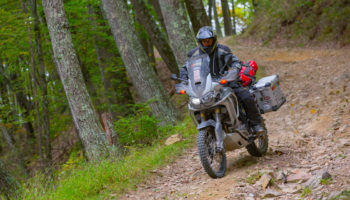 Touratech’s Open House is Going to be Epic! Yes – it’s that time of the year again when the cold sets in, and motorcycle travel dwindles. For many across the country, the fall and winter seasons mean snow, cold concrete, and a parked bike. Though storing motorcycles correctly for winter is preached throughout the industry, many riders continue to neglect their motorcycles before parking them. This can create many problems ahead of that first spring ride. 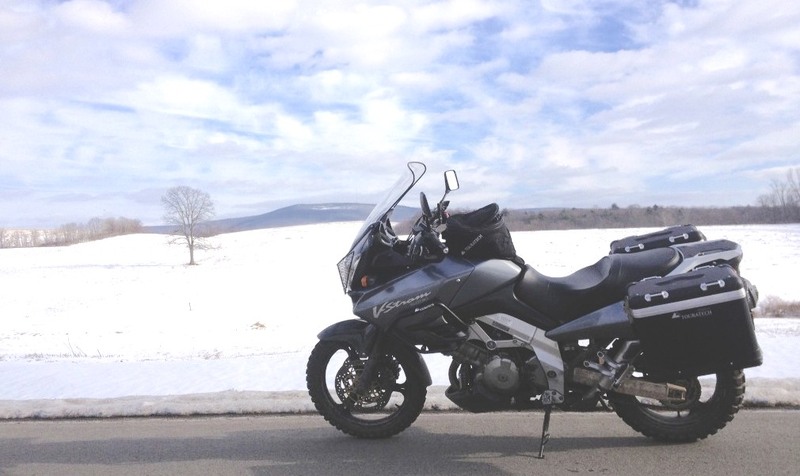 Don’t worry; we’re here to remind you of proper winter motorcycle storage with these eight tips. 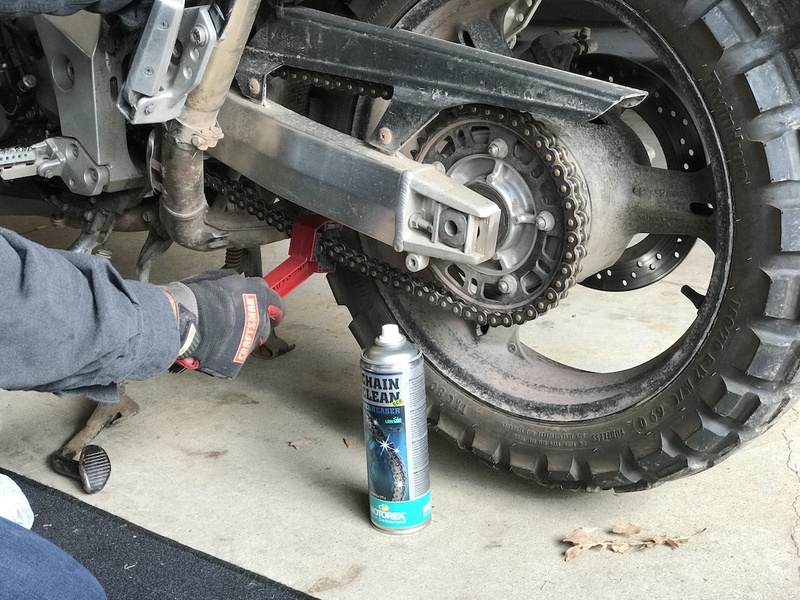 Don’t cheat your bike out of any of these motorcycle maintenance protocols; you’ll be rewarded by an optimal-running motorcycle from day one of the new riding season. 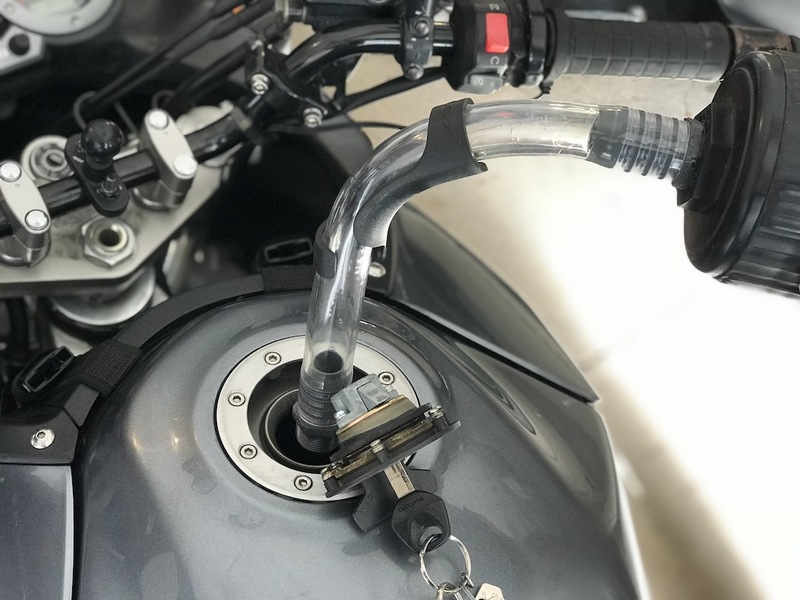 Fuel Tank: To Fill, or Not to Fill? To prevent oxidation from forming, you either need to completely fill or empty your gas tank. The former is simplest, but just remember to add some fuel stabilizer. Also, when you know that last ride is nearing, run some fuel cleaner to cycle through at least a tankful before filling her up and storing it. Oil Change: Before or After? There is still debate on whether to change your motorcycle oil before or after storage. Changing it before gets harmful contaminants out, and allows your internal engine parts to bathe in a fresh coat of oil. Fresh oil before storage is crucial for optimal engine longevity. At the very least top off your other fluids, including clutch, brake and radiator coolant. If you ride more than 10,000 miles or so a year, and especially if you do much off-road riding, take the time and replace your clutch and brake fluids before winter motorcycle storage. As for coolant, go by your OEM specs. We’ve known riders that got 10+ years out of batteries, and others that only get three years. The main difference? The riders who got the most years out of their batteries relied on a trickle charger. In the most basic explanation, a trickle charger replenishes battery power at the same rate in which this power naturally discharges. 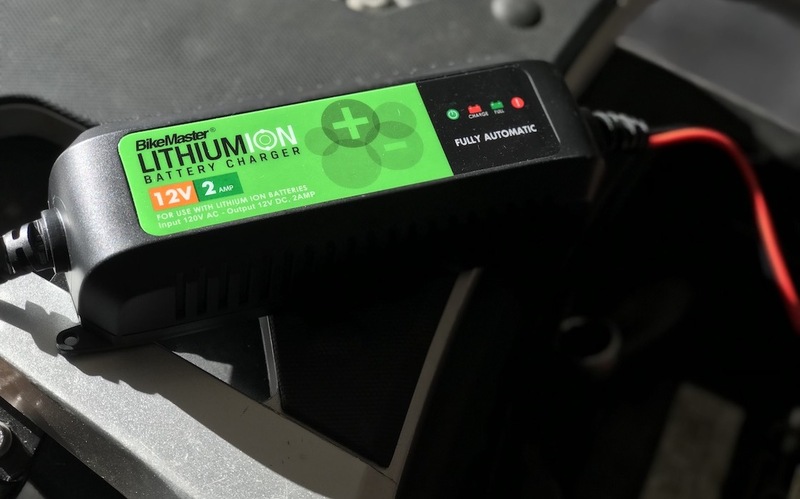 A typical motorcycle batteries self-discharge about 1% for every day when not in use, this is why it’s also recommended to use a trickle charger whenever the bike is sitting for more than a week or so. Motorcycle tires are expensive, especially for us that thrash knobbies around on the street. When storing your motorcycle, the best scenario are stands for both front and rear wheels to remain off the ground. But if not, and since most ADV bikes have a center stand, it’s best to keep the rear tire off the ground and spin the front wheel once a week so you don’t develop flat spots. If both are on the ground, try to spin both once a week so you don’t develop flat spots. Also, keep the pressure at maximum recommended PSI throughout storage to maintain tire shape. If you only wash your bike once a year, make sure that time is before storage. Besides cleaning the dirt that can containment parts, and cause trapped moisture that leads to oxidation and rubber deterioration, a good cleaning sometimes helps you discover things that you wouldn’t have seen otherwise, such as bent spokes, worn brake pads or rust. The best time to address these issues is over the winter if you like to spend those winter nights with adult beverages and some wrenches. If not, at least you’ll immediately what to address when it comes out of storage. And always start your pre-motorcycle storage cleaning with a serious scrub down of the chain. Loads of chain-safe chemicals are available, along with various types of brushes that cut the tasks in half. Clean this first because if you’re like most mere motorcyclists, cleaning chain is just a messy process. For those of us who bought used bikes that were stored away in sheds or forgotten in the corner of a garage, likely 7 out of 10 dealt with some weird stuff in the air filters. Mice and other little rodents love to take winter space in these areas. We once counted over 100 pieces of dog food from inside a V-Strom’s airbox after the bike was saved from a back porch. These rodents also like to spend some time in exhaust pipes. The best solution is to plug any inlets with some rags. Also, if rodents present an issue, take your seat off and store it in the house. When food is low, seats apparently make good nutrition. Now that you’ve followed all steps above, it’s time for the final piece – a cover. Various covers are available, and the one you need all depends on your motorcycle’s sleeping quarters for the winter. If it’s in a comfy, heated garage, a thin cover to prevent dust is all that’s needed. For others that are stored away either in sheds or outside, a breathable outdoor motorcycle cover is a must. There are also ones that fully zip around the bike and have oxidant-reducing elements to prevent any type of rust. Above all make sure your bike is completely dry before every storing.